Jack Waddington completed BA Painting at Camberwell in 2016. 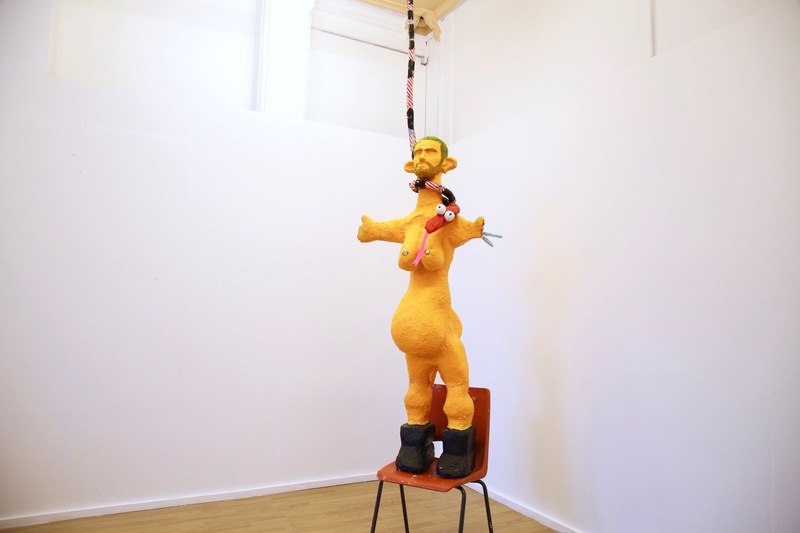 Originally from Hampshire, Jack is currently in Stoke-on-Trent where he was awarded an AirSpace Gallery residency. 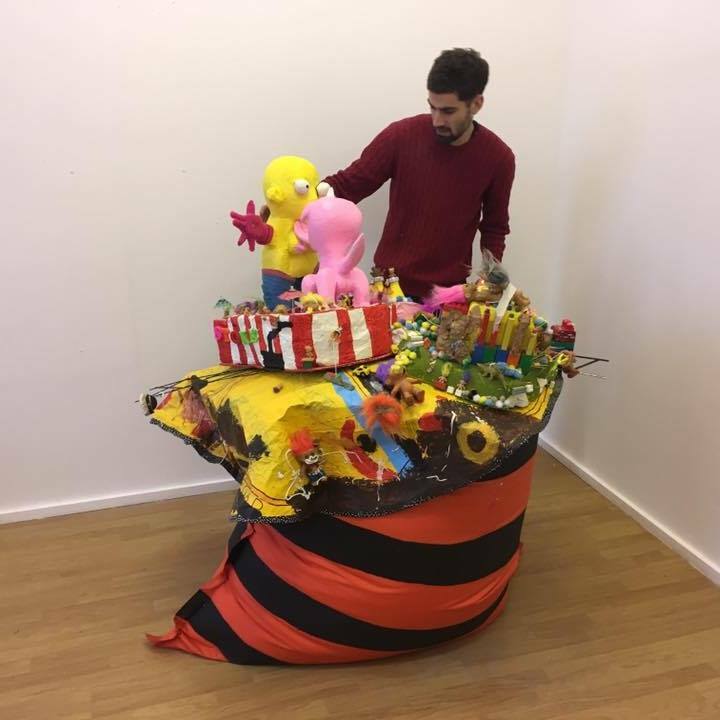 Jack caught us up on his residency, the work he is making and his time at Camberwell College of Arts. Fortunately my foundation tutor at Southampton was a Camberwell student in the 1970s and he recommended the college. I took his advice and had a look at some of the colleges around London. 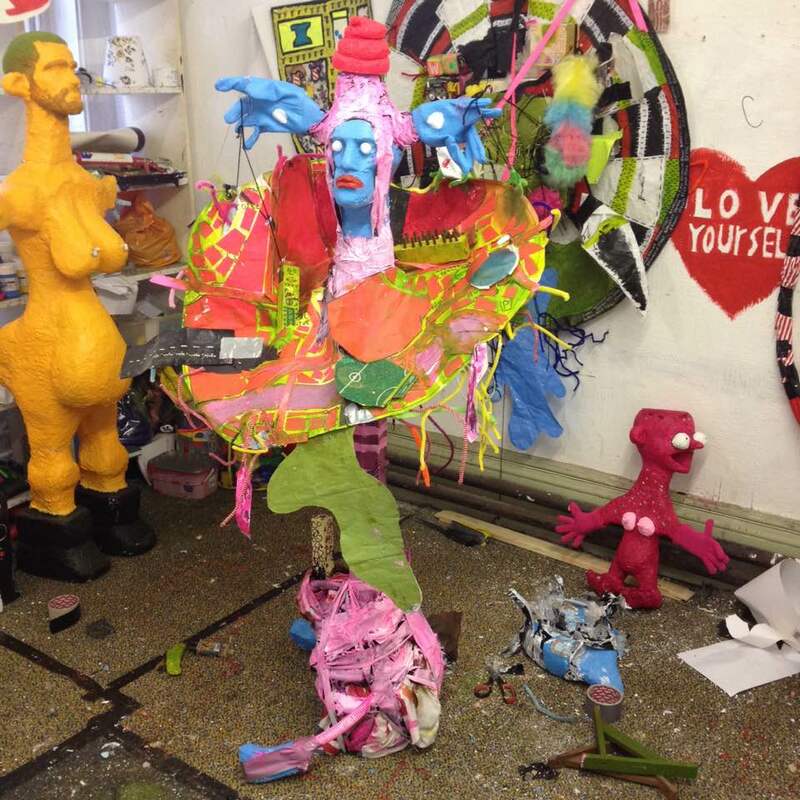 Camberwell to me had an obvious emphasis on the physical nature of making and I sensed it would be the best environment for me to carry on materialising my angst. Shortly, and luckily, after graduating I was awarded a six month graduate residency at AirSpace Gallery in Stoke-on-Trent. The residency will result in my first solo show outside of university. I’m into my last month now and I’m working as rapidly as I ever have been to get everything ready. I’m running on salmon and porridge and it’s working. My work doesn’t have a one-dimensional outlook or conclusive justification, although since leaving Camberwell I’ve realised all my creations concentrate on the nature of self. Maybe I see creating as an act of therapy – I like to think art creation is a conceited activity to aid our self-esteem. 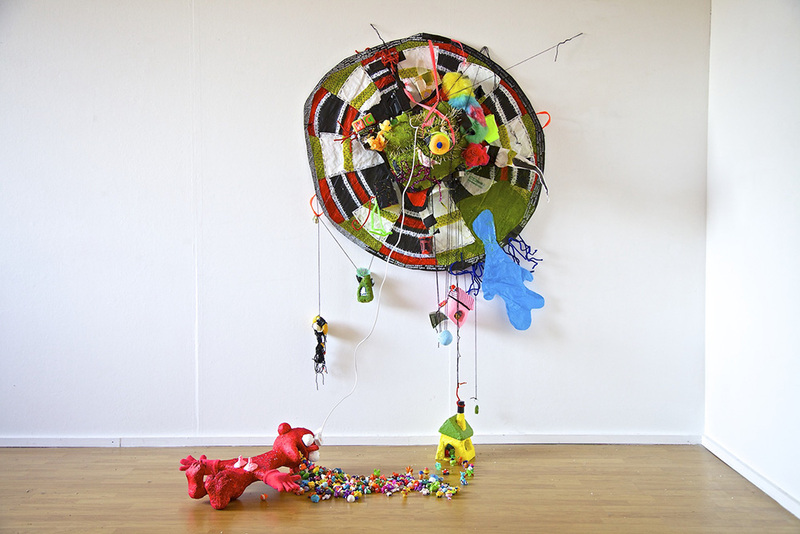 Through painting and sculpture I form mixed media assemblages that present psycho-geographical scenes with a deliberate naivety, often inhabited by figures that are somewhat submerged within their setting. To me, in the manifestation of artwork we tackle a problematic topic that requires an investigation and offer it a resolution. It is simply and sweetly a desire for achievement. It is a sensitive act and I like to embrace this innocence that we all try to suppress. The relationship between ourselves and our environment and how we crave satisfaction within a fabricated setting is something that intrigues me. Currently I’ve been working on a body of works for my show Give Me Love. Since starting the residency I’ve become lost within the realm of sculpting and I’m not looking to leave just yet. I’m bonding with polystyrene and it’s my go-to material for constructing figures. I’m enjoying the dialogue between the handmade and the found objects and the chaos and intensity I’ve been aiming for is presenting itself physically with a greater immediacy than before. Camberwell felt like a home and the work I produced felt at home. Creating work within the same environment for three years has that effect on you. New doors were always opened thanks to the support of tutors and to the generosity of the whole place, so it was difficult to move on. In a practical sense I’ve learnt how to be resourceful with my materials. Entering a life without loan instalments you realise just how easy you had it at university. Up-and-coming in the Jack schedule we have many events to anticipate: next up is the solo show Give Me Love in late February, followed by my return to London in the summer. I’ve prioritised the gap in-between to learning how to accept myself. I curated and organised an external group exhibition Combat for Comfort, that centred on the idea that we create to combat concerns in order to reach a state of comfort. It was an enjoyable experience and we got a decent reception. I am always looking at Ken Kiff, he is my go-to man for inspiration. The dichotomy between delicacy and crudeness that evolves in his work is beautiful. 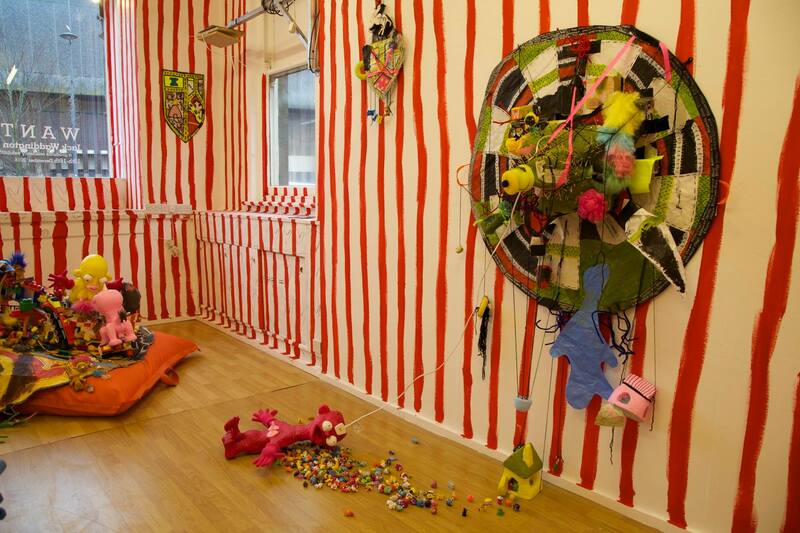 And finally, do you have any advice to students looking to start BA Painting at Camberwell? Who am I to offer counsel!? Place yourself on a mental treadmill and follow its route. You don’t need to realise the destination but as long as you have a trajectory you will be fine. Speak to the tutors as much as you can, pester them and encourage them to encourage you to encourage yourself.